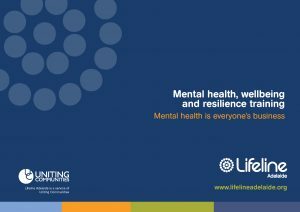 Lifeline Adelaide has a long history of providing suicide prevention training to businesses and individuals in the South Australian community. Invest in your staff and customers by providing Workplace Suicide First Aid training delivered by experts from Lifeline Adelaide. A partnership with us will positively impact your workforce, their families and your stakeholders, in turn increasing workplace morale and productivity. Training your workforce to understand and assist people at risk of suicide is vital to maintaining workplace health and safety. Lifeline’s training is an effective way to promote suicide prevention and enhance mental health support services within your business. Taking a proactive approach to mental health serves to build an organisation’s reputation as an employer of choice, helping them to recruit the best and brightest people. Untreated mental health conditions cost the economy $11 billion every year – this is even greater when staff turnover, incident claims, insurance payments and the effect upon other employees are considered. There is a significant return on investment for improving employee wellbeing and mental health, with every dollar invested returning $2.30 in benefit. This is a big bottom-line impact. There are also additional intangible benefits, such as increased engagement and staff retention, strengthening the business case to invest in employees’ mental health.